Last week, I met with friends and found that we don’t talk too much to each other, but only addicted on our phones. I grabbed my friend’s phone and saw the dazzling Apps, and the interface design of each App is very wonderful, no wonder they were so addicted in. Here I will share you some mobile Apps with wonderful interface design for everyone to appreciate and comment, hoping that you can get come insights! Now the mobile phone screen size is more and more enlarged, but it is always limited. Therefore, streamlining is a consistent criterion in the APP interface design. Streamlining doesn’t mean more content reduction, but paying more attention to express the key point. Focusing on user experience principles and follow the user visual logic, if your design looks pleasing to the eyes, users will like it. 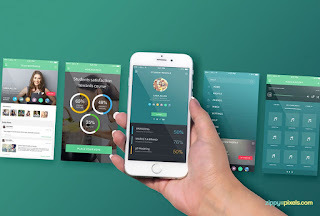 Here is a selected list of mobile Apps which have wonderful interface design. Hope you guys will like it and share your thoughts. 1. The first case has no modification in the background, the use of color is more traditional, its special place lies in the font changes. 2. MUJI has always been known for its minimalist, all designs are original and without any modification. This idea is also used to it’s own APP interface design. Simple things always make people look comfortable and quiet. 3. PicLab is a kind of filter camera APP. Therefore, the background deservedly uses the Metro style pictures which are pieced together. 4. This is a recommendation APP which is different from ordinary APP. The icons of each business are converted into a small icon with business characteristics in this APP. So that users can more clearly understand the characteristics of the business. 5. This is an APP design for daily cost accounting. The pattern in the middle part of the is concise but not meaning to spend money like water. It is very consistent with the intention of APP and hopes users pay attention to thrift. This case allows us to understand that a meaningful icon or text can be the only focus of the interface. 6. This APP looks more like a real scene. The real background image matches a simple icon.The only flaw is the Login registration button at the bottom, and the interface feels out of place. But it is undeniable that the theme of Between is very well presented in the entire interface. 7. This is an iPad client APP, using the side navigation design. The benefit of side navigation is that you can design the middle part of the interface without any worries, the whole App interface can naturally give users a simple and refined feeling.